Lacy phacelia (Phacelia tanacetifolia): growing, planting, caring. The perfect green manure for your vegetable garden. Full description for Phacelia tanacetifolia not yet available. The phacelia is an annual herb of the Hydrophyllaceae family. Its solid and rigid stem, tinged with red, covered with stiff hair and quite thick, can reach one meter. The leaves, alternate, are deeply divided and recall those of tansy - hence its name! The beautiful, very fragrant flowers are grouped into scorpiooid inflorescences - in the form of a stick that unfolds as and when small flowers blossom. The latter have blue-lavender shades; it is the five stamens and two styles that clearly emerge from the five-petal corolla. 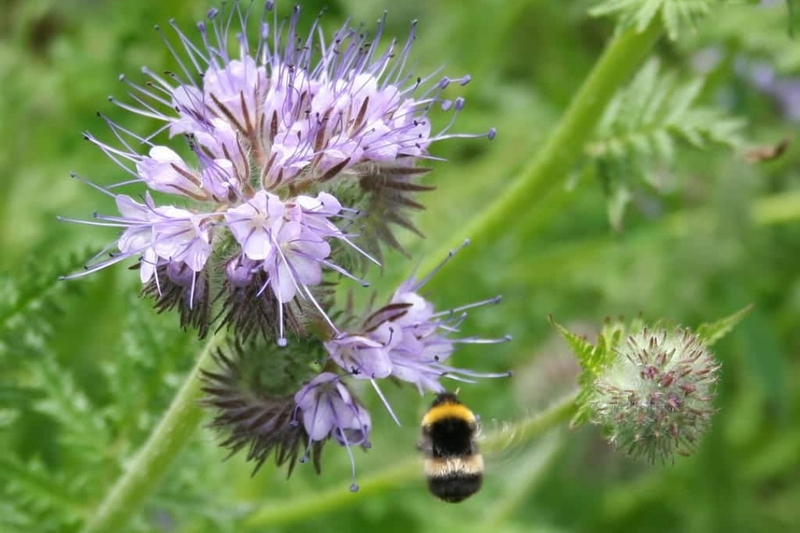 Phacelia can be sown from March to October, but it is usually done in early spring. Warning: it needs cool temperatures to germinate. If it is too hot - say more than 10 ° - germination will be random. Phacelia prefers the sun - it will make more flowers - but tolerates semi shade. The soil nature does not matter to it and it grows almost everywhere. Warning: it is easily reseeded and can colonize a garden! Sow fairly dense - too far apart, plants would compete less well with weeds - on prepared soil. Cover the seeds with the rake and tamp, to bring them into contact with the soil. Water to hasten germination if the weather is dry. Beware again: if you harvest your own seeds to sow, wait 2 months before using them: they need a period of "dormancy". At the beginning of autumn, fruits each containing four seeds will be formed. Cut and tap the stems above a container: the seeds will come off and fall. Seeds can keep germinative hability for 5 or 6 years if kept in a dry place away from light. In any case, wait 2 months before using them: they need a period of "dormancy".